I’m ashamed to say that sunscreen has taken a backburner in my priorities over the last few years. As I get older and understand how important it is to protect my skin from the sun’s harmful rays, I’ve started testing different products and formulas to find the absolute best one for me. I have to admit, it’s proven to be a little difficult—it’s hard to know where to start or what to look out for. Personally, I have sensitive, acne-prone skin and am always hesitant to drop money on a product I’m relatively unfamiliar with. If you feel the same way, I’d recommend taking a look at my top three recommended sunscreens. Go to some drugstores and ask for samples—most are happy to give you some—and patch test on your jaw or neck to make sure you react well before applying a full coverage. Oh, and don’t forget to reapply! This sunscreen was my first big sunscreen purchase over a year ago and I have to say, I’m a huge fan. The formula is targeted at those with sensitive skin and goes on smooth and creamy, almost like a moisturizer. Since I am a person of colour, one of the things I’m always looking out for is white cast—which I haven’t experienced in my time using this sunscreen. It has a pleasant smell, feels moisturizing, and goes well on top of other face products or underneath makeup; it’s somewhat mattifying, which is a bonus for oily skin. SPF 50+ Emulsion offers UVB-UVA protection, the mineral titanium dioxide, and water resistance for up to 40 minutes. It also contains thermal spring water and a vitamin E derivative to keep the skin soft and calm. I’d recommend this in the winter, when your skin might need a little extra moisturization. This product is my go-to sunscreen in the summer for a number of reasons—it’s developed for sensitive skin, is very light in texture, and lasts forever. The formula is super watery so it can be hard to work with. I recommend squeezing a few small drops on your face to rub it in. This is a chemical sunscreen, which means it absorbs into the skin, as opposed to physical sunscreen—such as a mineral-based sunscreen—which sits on top of the skin and acts as a UVA ray blocker. This product is non-comedogenic, fragrance-free, mattifying, and incredibly light on the skin while offering a high SPF count with broad spectrum UVB-UVA protection. It doesn’t leave a white cast and works well with other products, so long as you wait at least 10 minutes before or after applying your next product. I’ve been a fan of Neutrogena’s Hydro Boost line for a long time. 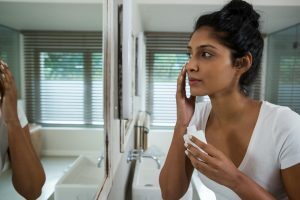 I first discovered it while on Accutane, when the gel moisturizer saved my skin from what felt like full-blown moulting. This sunscreen is my favourite-feeling formula. The gel lotion is soothing and settles into the skin wonderfully—it’s the one sunscreen where I genuinely forget that I’m wearing it. Having oily skin, I wasn’t sure if this moisture-targeted line would be right for me, but the texture is great and offers non-greasy moisturizer all day long. Hydro Boost Sunscreen SPF 50 provides broad spectrum UVB-UVA protection, wears well with other products, doesn’t leave a white cast, and is non-comedogenic, so it’s good for most sensitive skin.